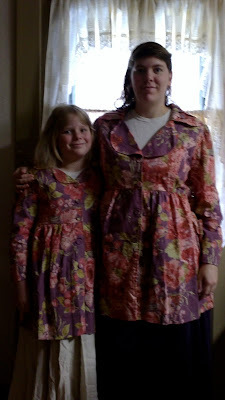 Hope's Cafe: April Cornell Mother/Daughter Matching Clothing!! Review! April Cornell Mother/Daughter Matching Clothing!! Review! I have to confess I had never heard of April Cornell until a few months ago, but after spending quite some time browsing their online store, I am hooked! From the beautiful flowing skirts to bright, summery dresses or light frilly nightgowns, April Cornell is any lady's dream shopping site! They even have home decor and linens! I received a set of matching jackets from the Mommy and Me collection, which features dresses, tops and more in matching styles/designs for mother and daughter! 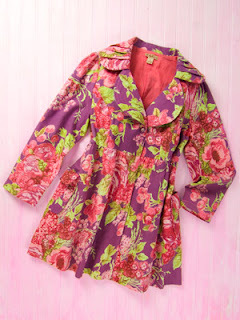 The Karilynn Jackets are made in a stunning floral print with a blend of coral, amethyst and green. It's very bright, and very beautiful. It features a rounded collar with pleats, and is fully lined in a matching coral-colored voile. It is a tad longer than some jackets, being approximately 34 inches from shoulder. I adore the fabric-covered buttons, and the deep patch pockets for holding any goodies you need! The jacket is gathered at the waist, and falls gently around the hips. The jackets both fit perfectly; M and I really enjoy matching! Sorry it's a little dark! I am highly impressed with the quality of the jackets as well. They are very well made, and seem like a piece of clothing we will be able to enjoy for a long time to come! Disclaimer: I was not monetarily compensated in any way for this post. All thoughts and opinions are mine. All quotes taken from the April Cornell website. You two look awesome! I love the jackets. The material is very pretty. You both look gorgeous in that bright floral print! I love the jacket! It's such a pretty modern floral!